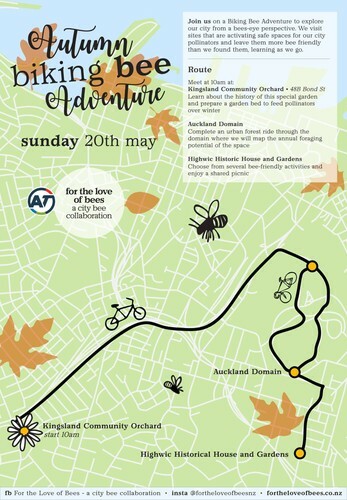 Join For the Love of Bees on Sunday the 20th of May for our Autumn Biking Bee Adventure. We meet at Kingsland Community Orchard, 48B Bond St, Kingsland, Auckland 1021 at 10am. The orchard is just off the Northwestern Cycleway - we will make sure it is signposted for you! Our Biking Bee is for everyone of all ages. As we go we will share information about our Plans for Regenerative Inner City Parks and Biological Bee Sanctuaries. We will be also be visiting Highwic Heritage House and Garden, and The Auckland Domain. Check out our Facebook event for more info!